Welcome to StackBlitz! We've created this documentation to help answer any questions you may have about what StackBlitz is, how to use it and what its APIs are. Take a look at our announcement post which covers our core functionality, feature set and motivations behind the project. Then just paste the embed code in an iframe and you're good to go! In your Medium article, simply take your project URL (i.e. https://stackblitz.com/edit/angular) and paste it. After you hit enter, it should automatically become an embed. Whenever you push commits to Github, the corresponding StackBlitz project automatically updates with the latest changes — ensuring Github remains your code’s source of truth. We currently support projects using @angular/cli and create-react-app. Support for Ionic, Vue, and custom webpack configs is coming soon! 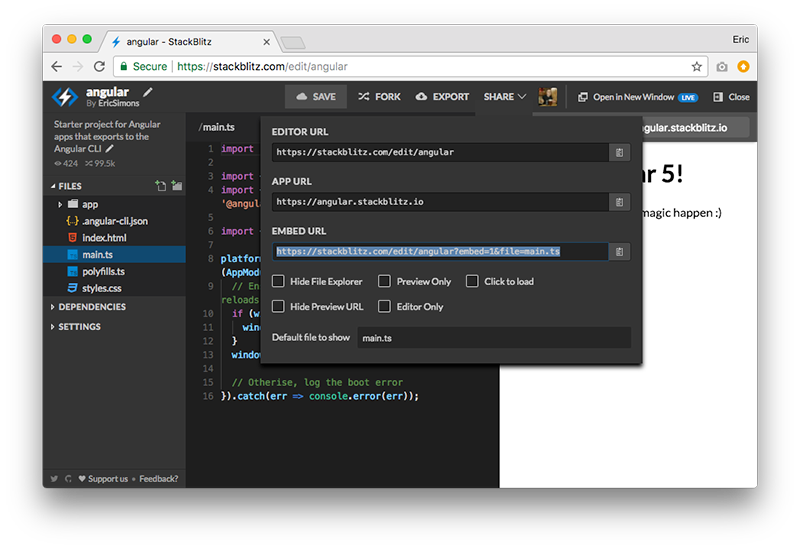 Wouldn't it be great if you could create & embed StackBlitz projects on-demand in your docs, examples, blog posts... in just a couple lines of code? openProject to create a new project & open it in a new tab (or current window). embedProject to create a new project & embed it on the current page. View live demo on StackBlitz. Create a new project and open it in a new tab (or in the current window). Create a new project and embed it on the current page. Returns a promise resolving it's VM instance. elementOrId: Either an element's ID string or the target HTMLElement itself. project: The same project payload as the openProject method. Yup, you can point directly at Github repos containing Angular/React projects and it'll automatically pull them down & run them. Open a project from Github and open it in a new tab (or in the current window). repoSlug: String of the Github username, repo and optionally branch/tag/commit. Embeds a project from Github on the current page. Returns a promise resolving it's VM instance. elementOrId: Either an element ID string or the target HTMLElement itself. Open an existing StackBlitz project in a new tab (or in the current window). Embeds an existing StackBlitz project on the current page. Returns a promise resolving it's VM instance. All of the embed methods on the SDK automatically connect to the embedded StackBlitz VM and return a promise containing an initialized VM class. This allows you to have programmatic access of the file system, package manager, editor, and more. Note: The VM API's are currently under active development—we'd love to hear your feedback. Apply batch updates to the FS in one call. Returns a promise. diff: A diff object containing files to create and delete. Get a snapshot of the entire FS. Returns a promise resolving the file system object. Open a file in the editor that exists in the current FS. Returns a promise. String. The URL of the preview domain that the user can open in new tab(s) as they use the embed. Every project created with the embedProject method gets its own unique preview URL. Returns a promise resolving an object containing the currently installed dependencies with corresponding version numbers.